Alex Mullen hadn't been expecting to win. 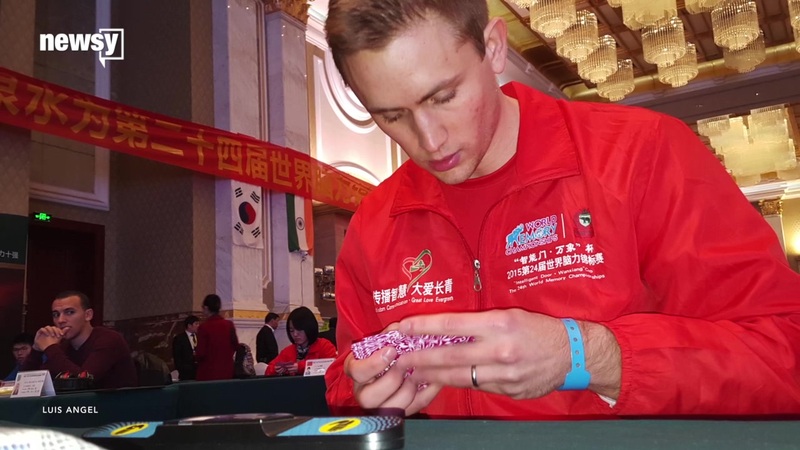 Looking back on December's three-day World Memory Championships in Chengdu, China, Mullen still figures he was one of the "dark horses." But going into the final round of the competition, the 24-year-old medical student learned he was in second place — just 300 points behind the first-place contestant, Sweden's Marwin Wallonius. The top prize could be Mullen's. All he had to do was memorize the order of an entire deck of cards in 23 seconds or less. He did it in 21.5. Mullen became the first American to win the World Memory Championships, according to the competition's website. He also holds the Guinness World Record for most numerical digits memorized in an hour: 3,029. 1. You forget how to do something you have done many times before. Forgetting how to get to your best friend’s house, or struggling to remember how to make your favorite meal can be a tip off to a real problem. 2. You have trouble learning something new. Electronics, computers or card games used to come easy to you, and now, you can’t figure out how to start the new toaster. You used to be handy, and now, you can’t figure out how to put together one of your children or grandchildren’s Christmas presents. 3. You repeat yourself in the same conversation. I think I do this a lot, but it is usually very late at night, and the person I am talking to is tuning me out. It can be very frustrating to both the speaker and the listener as it is tempting to say, “Stop talking. You told me this already and if I have to hear about your work-out this routine one more time, someone is going to get hurt!! !” I think I do this a lot, but it is usually very late at night, and the person I am talking to is probably tuning me out. 4. You are having trouble making choices. You stare in the fridge trying to decide what to drink, or you stare at the closet with no idea what to wear. This may be a red flag if it is happening routinely. 5. You can’t keep track of what happens in a day. If you are having an increasingly difficult time remembering if you showered, took out the garbage or went to the food store, you should discuss your concerns with your doctor. I started each of these warning signs with “you”, but most often, if there is a true diagnosable problem, it will be a friend or family member who will notice first. If someone else tells you that you are losing it — hopefully, they find a more sensitive way to say it — you should probably take it seriously. If you have a loved one whose memory seems to be failing, bite the bullet and tell them you are worried. There are many things that can cause memory loss in addition to dementia, some of which are correctable. There are also treatments for Alzheimer’s and other forms of dementia that can help to halt the progression of the disease. If you noticed someone was short of breath or was clutching at his or her chest, you would address it. The brain is an organ just like the heart and lungs. It needs to be taken care of. Speaking of letting people know you are worried about them, I am offering $500 bucks to anyone who tips me off about my intervention. ER physician Dr. Travis Stork shares a simple trick to improve your memory recall. Here's something you might not expect: Mullen claims there's nothing superhuman about his brain — that growing up, he'd always had an "average" memory. Becoming a world-class memory athlete only took a few years of practice — and the creation of around 100 "memory palaces." But more on those later. "I don't have an exceptional memory," Mullen told Mic. "It's a surprise to most people." Mullen began researching memory techniques as a junior in college, hoping they could help with his schoolwork. "I felt frustrated; I was always cramming for tests and forgetting everything instantly," he said. He started by reading a Bill Gates favorite: Joshua Foer's Moonwalking With Einstein: The Art and Science of Remembering Everything. "I was hooked from the beginning," Mullen said. "I couldn't believe I'd never heard about this stuff." Top memory athletes tend to share the same techniques — techniques we commoners can allegedly learn too. Mullen shared with Mic some of the strategies that helped earn him his top spot. Humans aren't good at remembering abstract things like numbers and cards — but we do have excellent visual and spatial memories. So when tasked with memorizing, say, a slew of numerical digits, "we have to convert those abstract things into something more memorable — something we can visualize as a mental image," Mullen said. "Imagine some sort of physical space in the mind's eye, and place those mental images into those physical spaces." The physical spaces should be real locations you know well, such as your workplace, elementary school or childhood home. In the competitive memory community, they're better known as "memory palaces." Here's how memory palaces work.When it comes to memorizing strings of numbers, Mullen mentally associates every digit from 0 to 9 with a different phonetic sound. For example, 3 is an "m" sound, 7 is a hard "c" and 5 is an "l."
For every series of three digits, Mullen merges the digits' accompanying sounds to create a mental image. The digits 3, 7, 5 sound like "Michael" — so he imagines former basketball player Michael Jordan. Mullen has a pre-determined mental image for every three-digit combination from 000 to 999. The digits 0, 7, 5 make "s," "c" and "l" sounds, so Mullen imagines an icicle. Next, he places those mental images along a trail of distinct "loci" through one of his memory palaces. If Mullen were using his childhood home, for instance, he'd place images alongside his mailbox, his driveway, his front door, etc. He assigns two images — each representing three individual digits — to each locus. "Say the first image was Michael Jordan and the second image was an icicle," Mullen said. "Maybe at my mailbox, I'm imagining Michael Jordan holding an icicle trying to jab open the mailbox to get the mail." That visualization would represent "375075." Memorizing 60 digits would be as easy (if you can call this easy) as placing 20 images across a series of 10 loci in your mental palace. Memorizing a deck of cards works the same way. For every possible two-card combination, Mullen has a corresponding mental image. More from Mic: Cory Booker Wants to Make America Great — But Will His Vision Work? As he scans a deck, Mullen mentally converts each consecutive two-card pair into its corresponding image, and places that image into his memory palace. "Memorizing a deck of cards is as simple as translating 26 different card pairs into 26 images," he said. Mullen isn't just trying to show off. His memory techniques are useful, he said, for memorizing med school material. He'll devote different rooms within a memory palace to different classes of drugs. Information on a drug's toxicity will go on one locus within the room. Information on the drug's negative side effects go on another. "It offers you organization," he said. Mullen's mission is to share his memory techniques with others; currently, he offers a series of video tutorials on his website, Mullen Memory. He plans to take next year off medical school to work on his memory-related pursuits full-time. In the meantime, Mullen's making sure he can live up to his prestigious new international title. "Since winning," Mullen said, "it's kind of become this fear that if I ever forget somebody's name, I'm going to be ridiculed."